Meg drove around to the other side of the rock and we disembarked again. 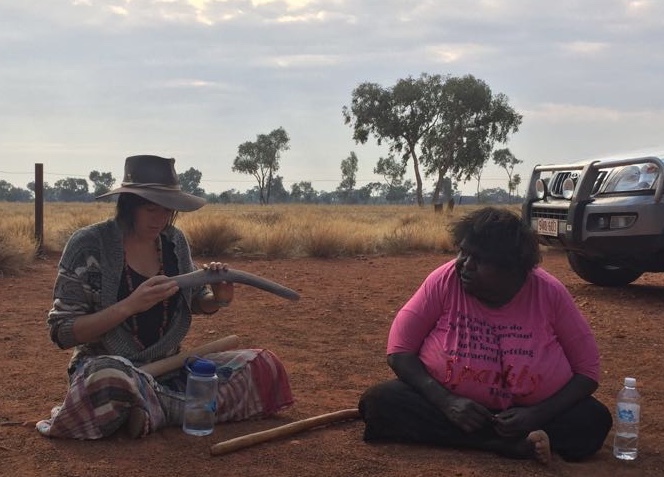 “After a little talk ‘n’ walk with an aboriginal guide, we’ll visit the cultural centre and then head out to our next camp for the night,” she explained. We were invited to sit in a circle on the ground by a young white woman who introduced herself as Donna. I wasn’t sure I’d be able to get up again, so I remained standing. I can hike, bike, or swim for hours but I have a hard time getting up off the ground due to my scoliosis. I used to think I would do something important with my life, but I kept getting distracted by Sparkly Things. The work sparkly was, of course, bedazzled with glitter. Community, I learned, referred specifically to Aboriginal settlements. I had heard something about some indigenous people somewhere not liking their photos taken, but Donna said to go ahead and snap away. 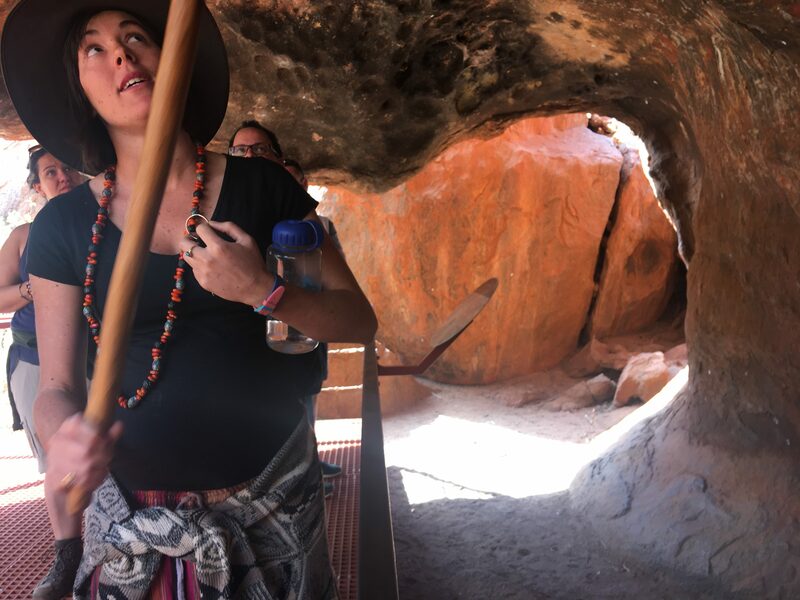 She said a few words in what I assumed was Pitjantjatjara, the local language. Bessie said about four words in response. Then Donna translated, “Bessie says ….” and talked for 10 minutes. Who knows, maybe Pitjantjatjara packs a lot of meaning into every word. This was repeated; Bessie didn’t seem into it, or maybe she was just tired, or maybe Aboriginal Australians also wear the dead-pan expression common to Native Americans. She would force out four or five words and Donna would wax on about various customs and objects which she passed around, including a boomerang. Heidi helped me up and we walked a short distance. The paintings were beautiful. They told stories using symbols for things like people, emus, and the sun. I had expected to learn something about the Dreamtime and creation stories, but as I wrote previously, most of them are sacred and not shared with outsiders. The Cultural Centre was a different one from the one we’d already visited. It was a circle of shops and workshops and a café around an open plaza. Heidi and I got in line and took turns keeping our place. It took 50 minutes to get two coffees. The gift shop was extremely expensive; I was relieved not to see “my” pillow cases. 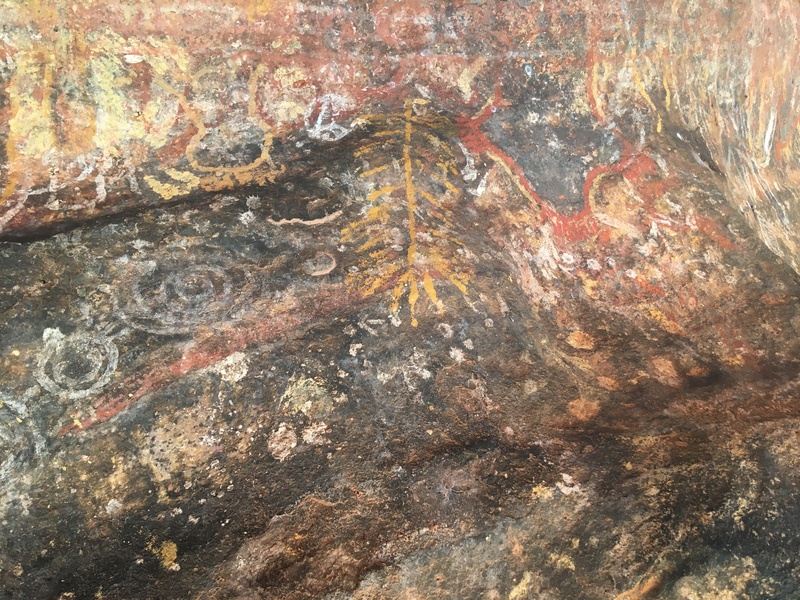 There was a workshop where Aboriginal women sat on the ground painting while tourists watched. I realize it is the Aboriginal way, to sit on the ground, but I felt very uncomfortable, like I was watching animals in a zoo. There were signs everywhere that said No Photos. I think they are trying to prevent people from taking photos of the paintings and then just printing them out without paying for the labor that went into them, which is substantial. Meg had been right, the museum was hard to find and once we did find it we had only 10 minutes left. I would have skipped the coffee and the shop for an hour here but it was too late. 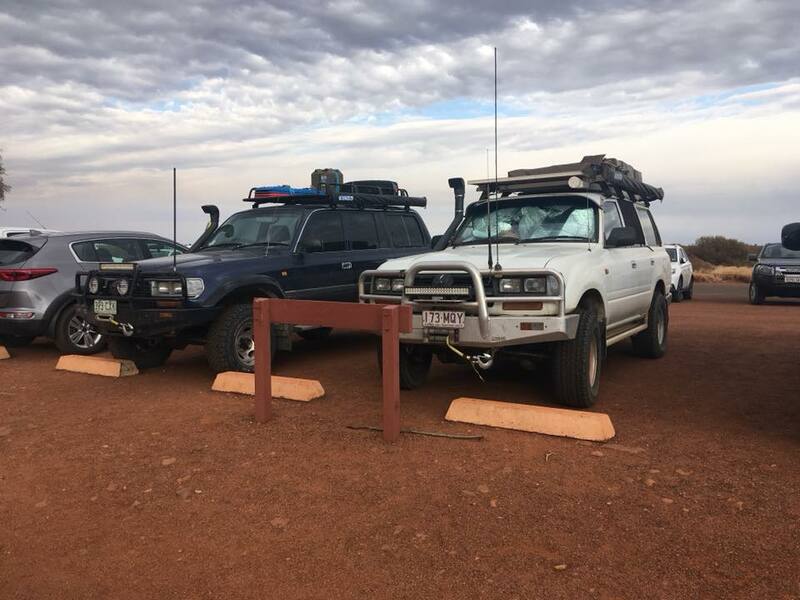 This entry was posted in Adventure, Budget travel, class divide, Culture shock, Travel and tagged Aboriginal Culture, Australia, Ayers Rock, Outback, Ularu on November 29, 2018 by Breaking Free. 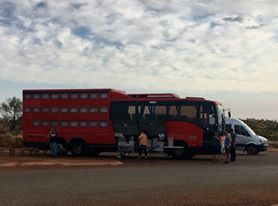 We had a few hours to kill before joining the tour that would take us to Ularu/Ayers Rock and other natural wonders with two names like Kata Tjuta, formerly The Olgas. 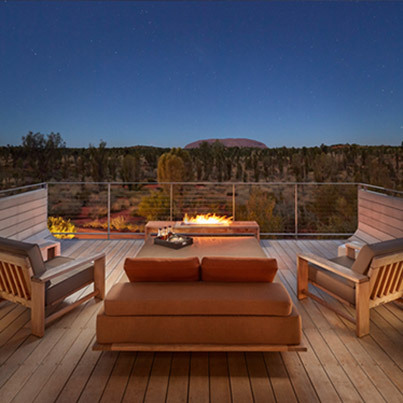 So we left the bunkhouse behind, with no regrets, and walked past Ayers Rock Campground, the Outback Pioneer Hotel, Desert Gardens Hotel, Emu Walk Apartments, Sails in the Desert, and Longitude 131, each of which was successively more upscale. That last one cost $3,000 a night and there’s a minimum of two nights. We looked at the brochures to see what you got by paying 40 times more than we had paid. “It’s glamping on steroids,” I said. The rooms were permanent tents with private views of Ularu. “I stayed in a place like this in Kenya, on safari,” I told Heidi. 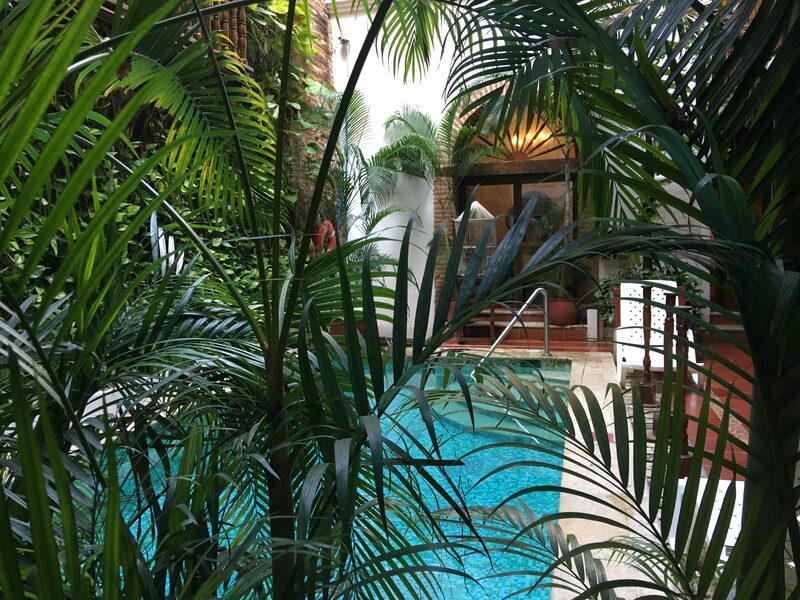 “It wasn’t as deluxe as this, but it was one of the nicest places I’ve ever been and it sure didn’t cost $3,000 a night. I don’t think I paid more than $1,200 for the whole week. Since you probably can’t read it, I’ll reproduce some of it below. 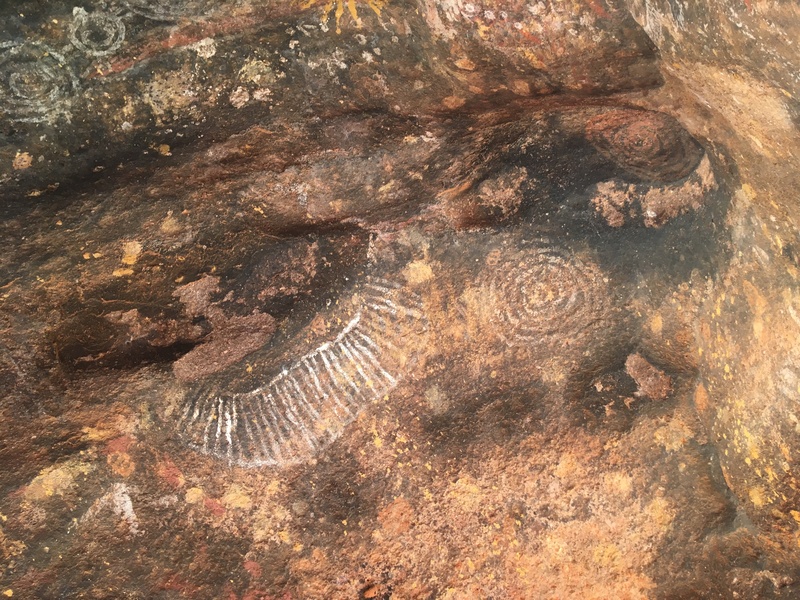 Aboriginal people first took action for land rights in the early 1960s when the Yirrkala people in Arnhem Land submitted a petition to the Australian government requesting recognition of their rights as traditional owners. 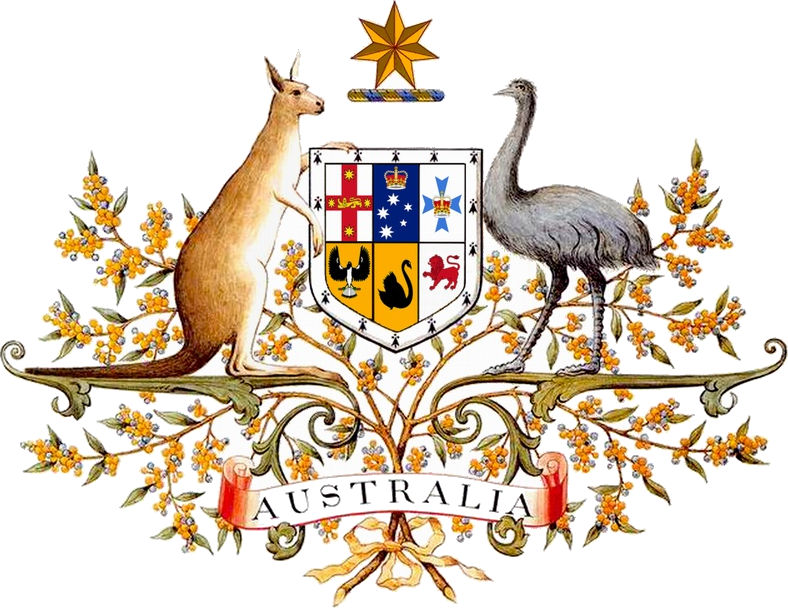 In 1971, their claim was rejected … ruling that the traditional owner property system was not recognized under Australian law and that Australia was “terra nullius,” an empty land, prior to 1788. Let that sink in. The Englishmen whose tall ships arrived in 1788 near what is now Sydney were, according to Australian law, the first Australians. The English made all the laws, naturally stacked in their favor. 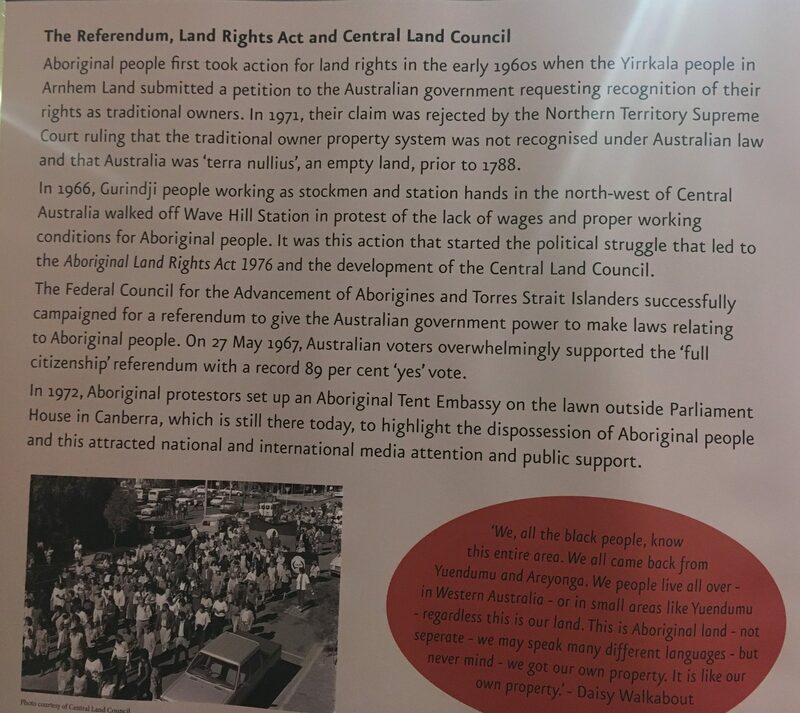 There was an Aboriginal civil rights movement in the 1960s, and in 1967 90% of Australians voted yes on a referendum that meant Aboriginals would be counted in the census for the first time. It also allowed the federal government to make laws regarding Aboriginals, instead of the states. As in the US, federal laws tend to take better regard of the rights and needs of all citizens. So, for instance—the federal government, in theory, makes more humane laws regarding segregation or voting rights than would, oh … Louisiana or Mississippi. I was seeing Aboriginals around for the first time. “Does Australia have anything like African Americans?” I asked Heidi. I encountered one guy from Argentina in my month in Australia, the owner of a fabulous Argentine tapas restaurant. The Australian census doesn’t ask about race, but it’s estimated that 91% of Australians are white or multiracial people who are mostly white, 5% are East Asian, 2% are Indian (dot, not feather), and 2% are Aboriginal. By comparison, whites make up 72% of the US population. Hispanics are 16%, African Americans about 13%, Asians 5%, Native Americans 1%, and 9% are another race or mixed race. Ninety-one percent white—no wonder it’s called the sunburnt country. 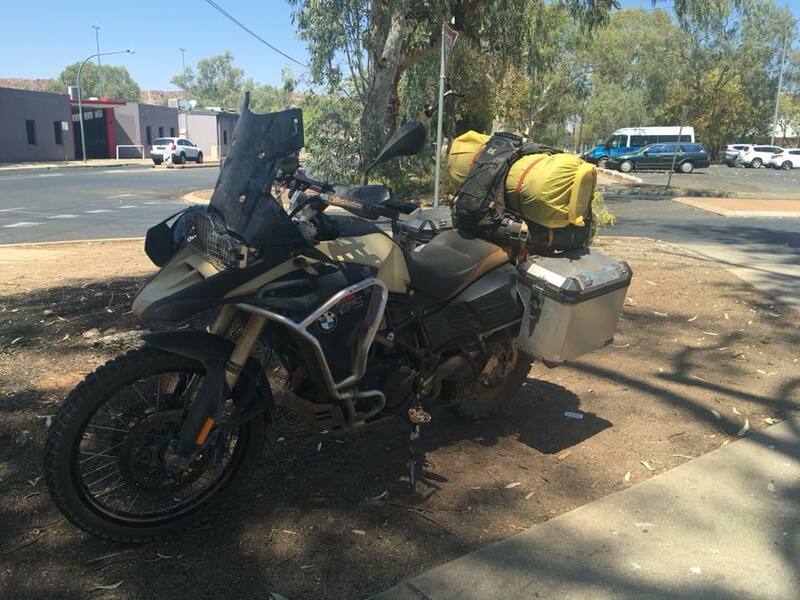 This entry was posted in Adventure, Budget travel, class divide, Culture shock, Living abroad, Travel and tagged Aboriginals, Australia, Outback, Ularu on November 18, 2018 by Breaking Free. 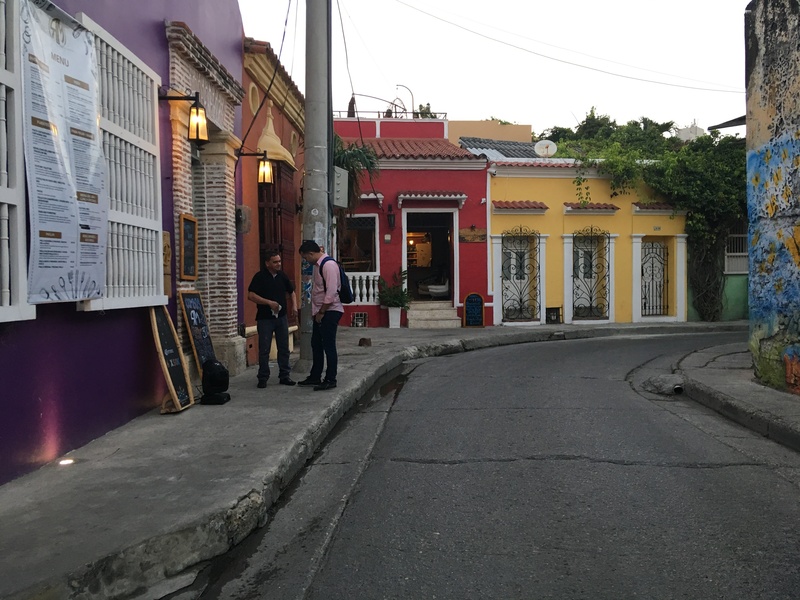 In Getsemani, we took photos of the brightly-painted houses. “It’s almost too perfect,” I remarked to Lynn. Everywhere I turned was a beautifully-composed photo. 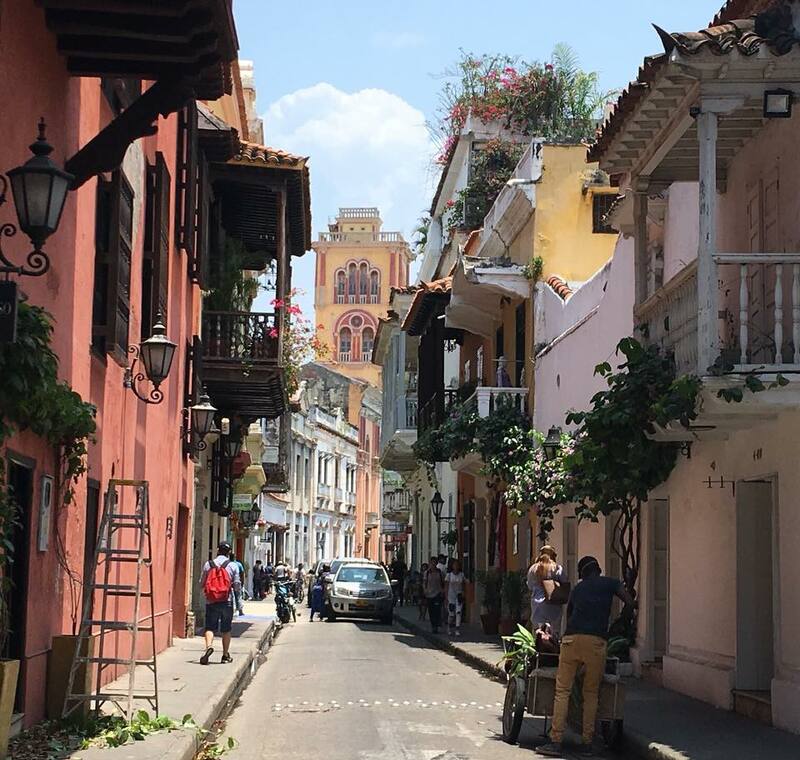 If you can’t take great photos in Cartagena, you can’t take them anywhere. It was Saturday night and the streets were thronged with people out for a good time. Who knew who was a tourist and who lived here? 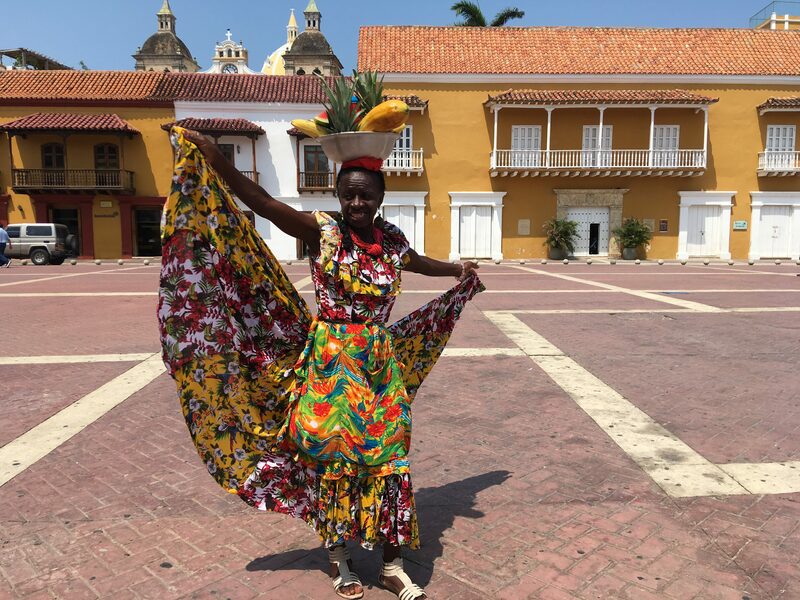 “Air BnB is ruining Cartagena,” Nora had said. 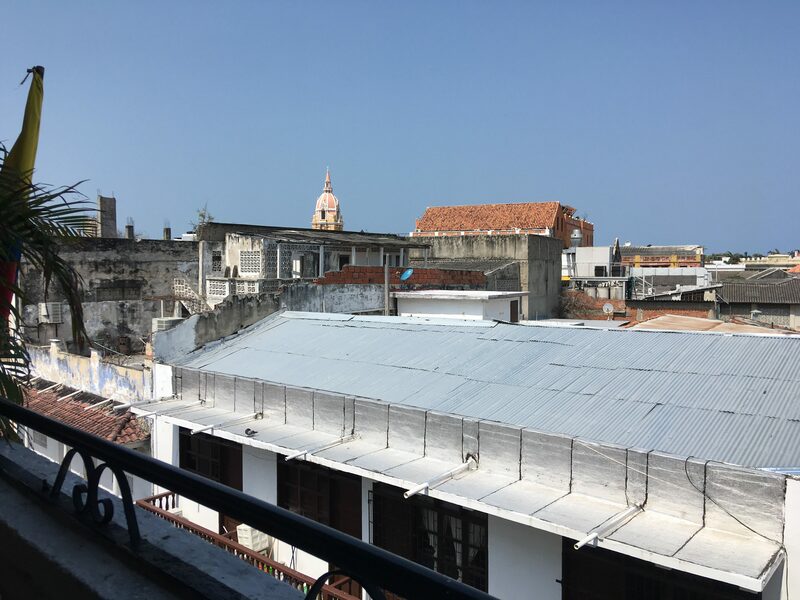 “Rich people are buying places to rent to tourists and Cartagenans cannot afford to live in the center anymore.” I’ve heard similar laments from Amsterdam to Venice. We passed through a bustling square with restaurants and bars. “Want to eat here?” Lynn asked. But of course the streets in Getsemani weren’t straight, or thoroughfares, and within 10 minutes we were lost. There were streetlights, but half of them were broken. People were hanging out drinking and playing cards on the sidewalks. Murals had been replaced by ugly graffiti. There was trash, broken and boarded up windows, and mangy dogs wandered past menacingly. The smell of pot was everywhere. There was no doubt that this was not a tourist area. After much drama in our heads, we emerged onto the square where we’d started. 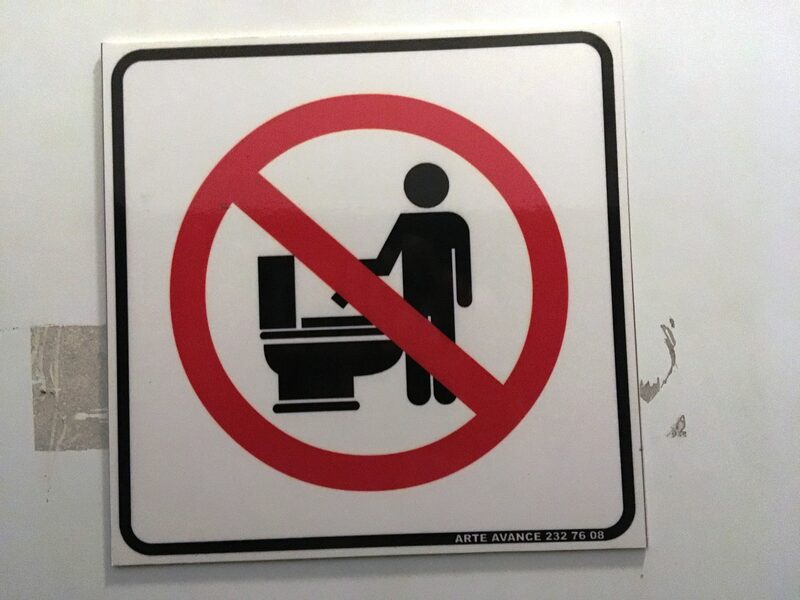 Do Not Point to the Toilet? Do Not Shoot a Gun Down the Toilet? Do Not Throw a Brick in the Toilet? And as always, too soon, it was time to go home. A driver picked me up at 10:30 the next morning; Lynn would begin her arduous return via Amsterdam later in the day. The airport was only five minutes from the center. This sign left no room for interpretation. 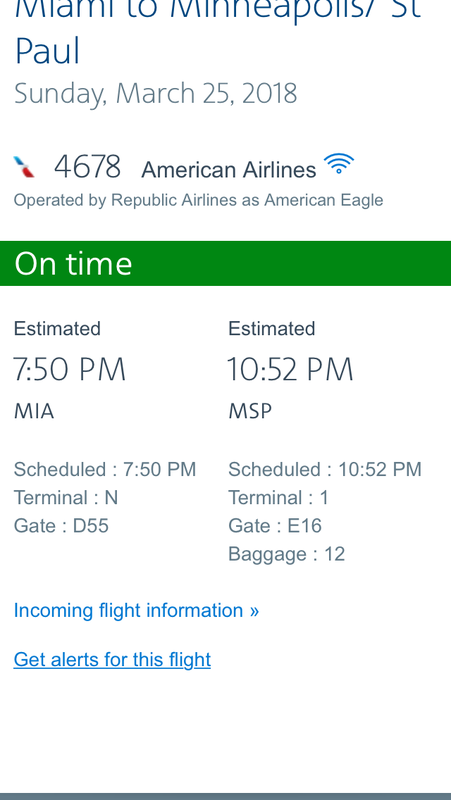 In Miami, I went through immigration and customs and then walk-ran to get from the last gate on D concourse to Gate E16, as indicated on the American website. I followed the signs for E 2-33. When I reached E11, the next gate was E20. “E16?” I asked two American Airlines agents. “There is no Gate E16,” they replied dismissively. I showed them the screen shot and they doubled down, acting as though I had made it up somehow. American—the airline that dragged that poor man off a plane when he wouldn’t give up his seat for no reason. The video system went down midflight so, since the same had happened on my arrival flight, I never saw the end of The Color of Water. They offered free drinks, so I had a beer and chatted with my seatmate. 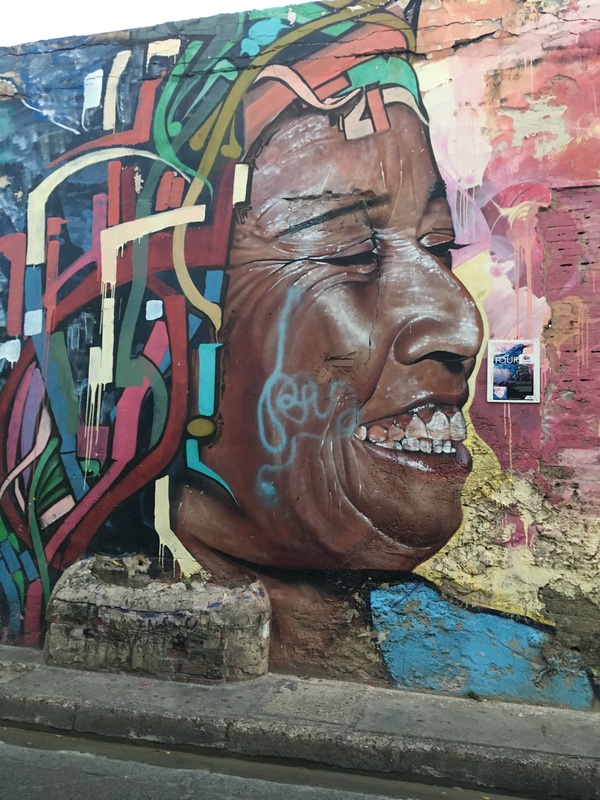 This entry was posted in Adventure, Budget travel, class divide, Culture shock, drug dealing, International Development, Poverty, Travel and tagged Air BnB, Cartagena, Colombia, Getsemani, Mural Art on June 2, 2018 by Breaking Free. 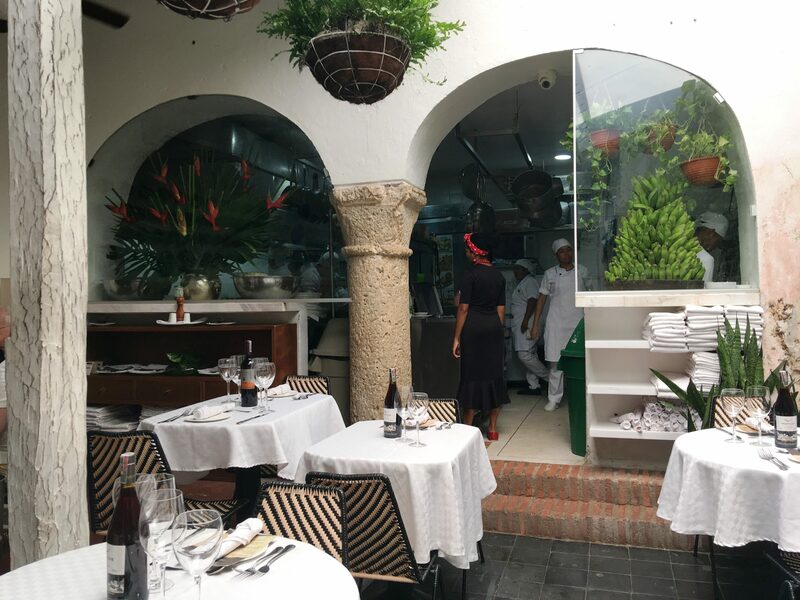 Our tour of San Pedro Claver over, we tipped Charles generously—at least I hope he thought it was generous. He had clearly poured years of his life into learning everything about St. Peter and his namesake church. Before we left, he scribbled on some scraps of paper and handed them to us along with some business cards. The business cards were for his cousin’s store, which sells Handy Crafts. 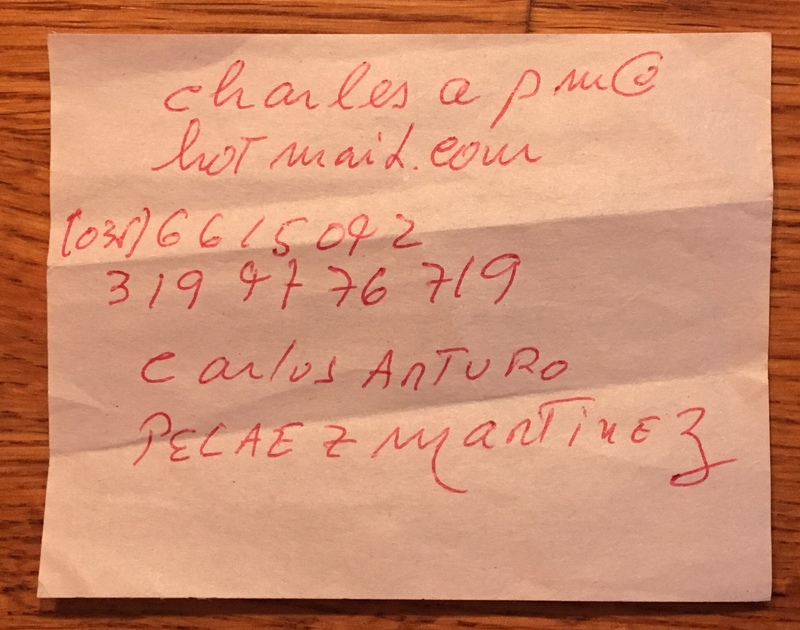 “My cousin, Fabiola, you can tell her I sent you to get a discount.” The scrap of paper had his contact details on it. 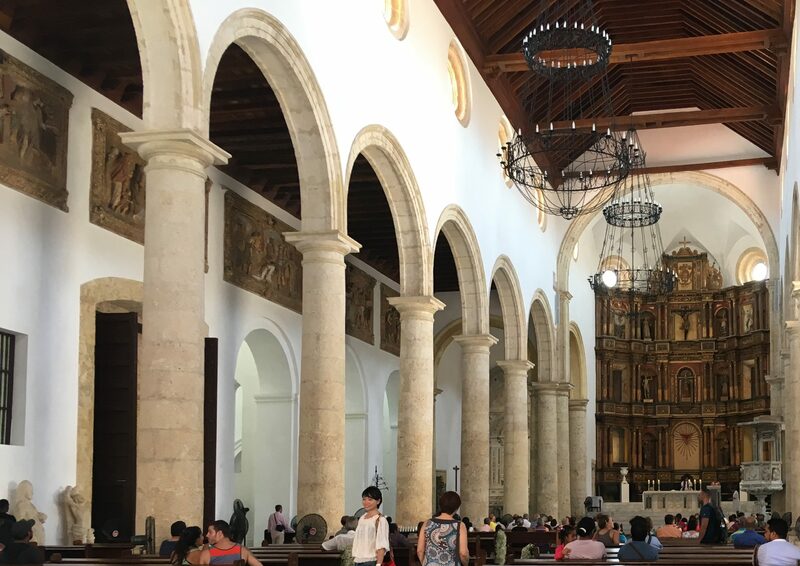 If you ever go to Cartagena and want a personal tour of St. Peter Claver Church, ask for Charles, aka Carlos Arturo Pelaez Martinez, and tell him Anne sent you and you want your discount. We wandered out into the blinding, blistering hot sun. In the square, this woman was posing for tourists with a bowl of fruit on her head. I really hate things like this, but I took a photo and gave her 10,000 pesos. It felt a bit like I was photographing a zoo animal. The irony of us being in the former Black Market wasn’t lost on me. Did her costume have any cultural significance? She wasn’t interested in talking. She needed to sell as many photos as she could, literally—Snap Snap!—to make a living. I guess it was better than working in a factory. Lynn and I always try to hit a grocery store when we travel. 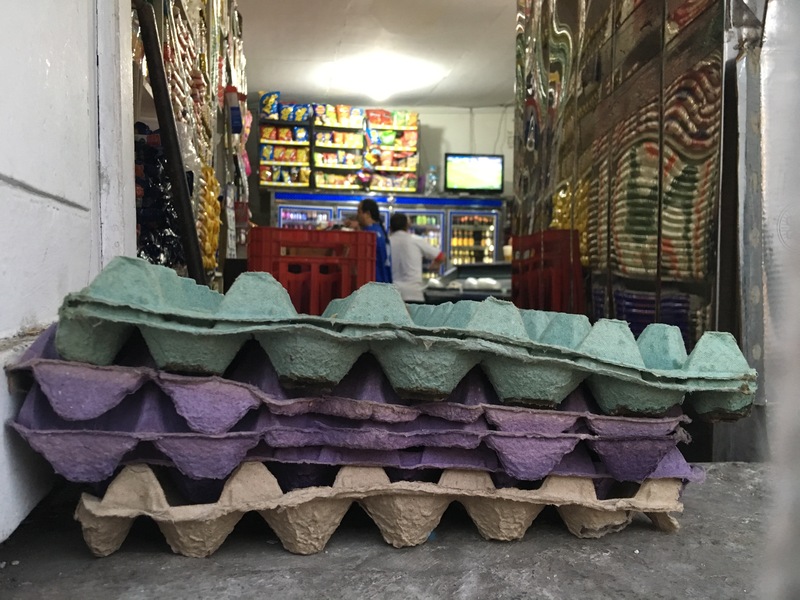 In Colombia, we were fixated on buying some of the crunchy corn kernels—sold in the US as Corn Nuts—which we’d had on salads and in ceviche and soups here. I don’t know which is more disturbing. 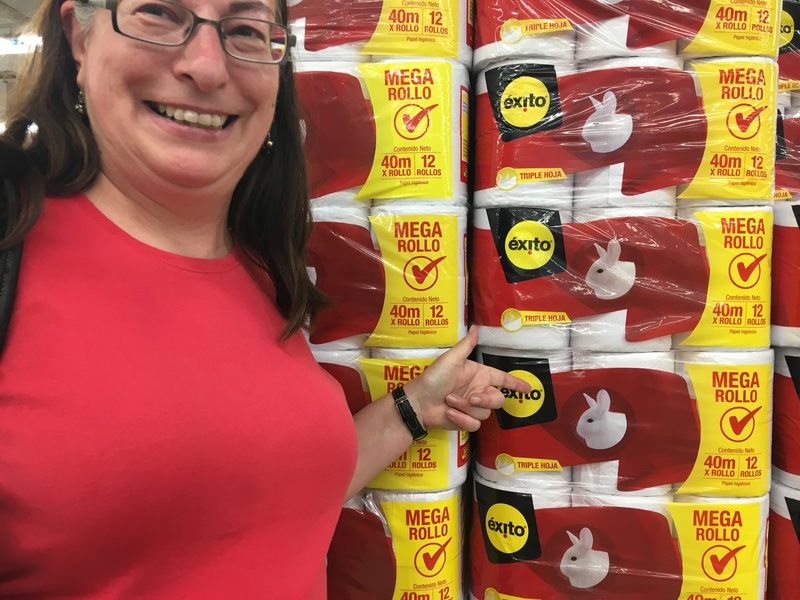 The thought of wiping myself with a white rabbit or that “Exito” means “success.” An interesting name for toilet paper. This ranks up with the “Colonial” brand cigarettes I saw in Belize. 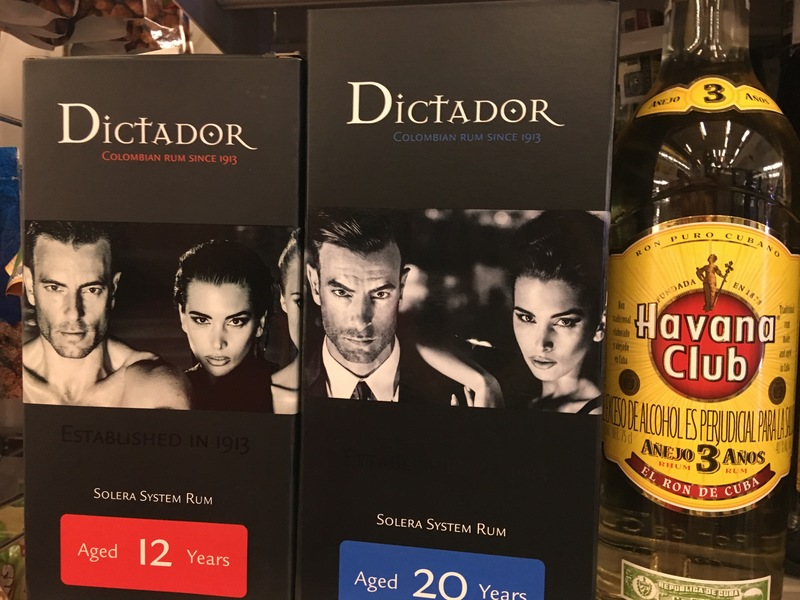 I mean really—what was the thinking on the marketing team when they came up with the brand name Dictator for a Latin American rum? “I’m telling you Jorge, dictators are hot.” Note that in one photo the man is dressed in a suit with a George Michael beard and in the other he is shirtless and clean shaven. We found our corn nuts and went to find lunch. 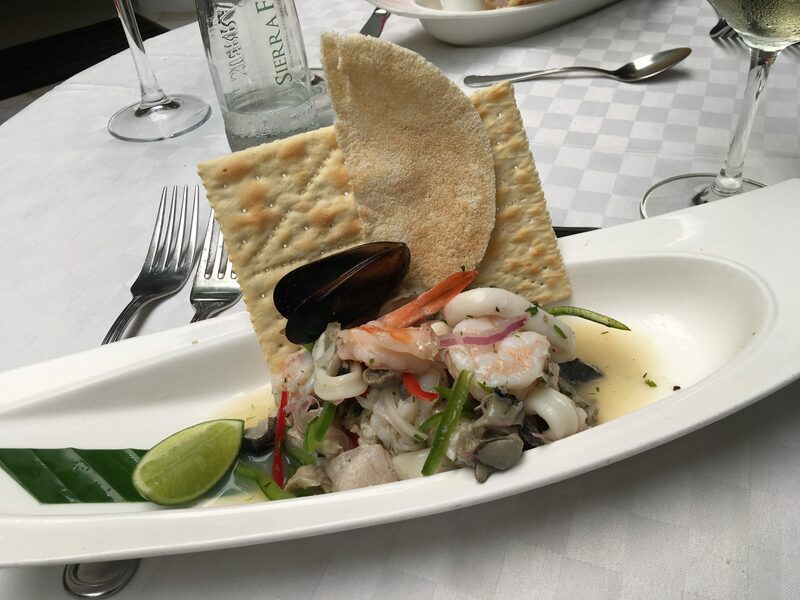 It seems like it’s hard to go wrong in the search for good food in Colombia, especially if you enjoy seafood. We found a ceviche restaurant and settled in. There was no point in rushing around the city in this heat. 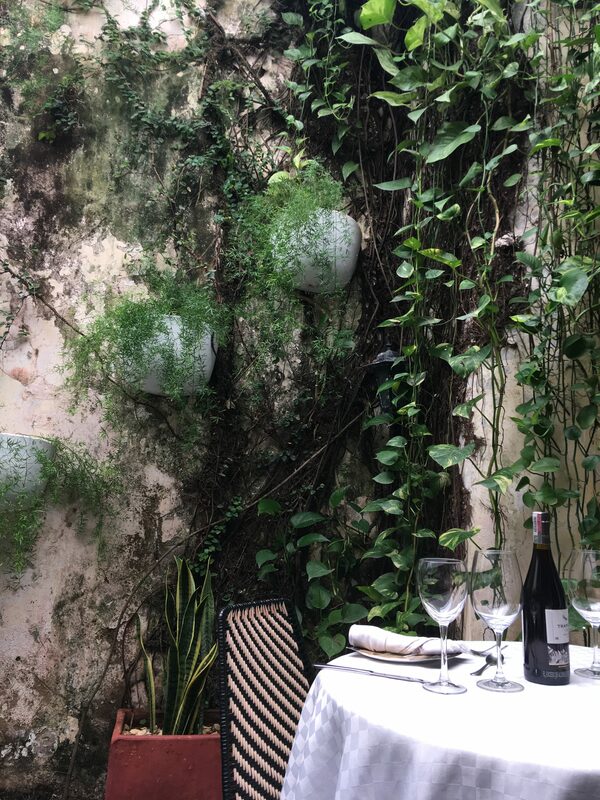 Being a plant lover, I appreciated that plants, vines, and flower arrangements were incorporated into the décor everywhere in Colombia. The ceviche didn’t disappoint, although I thought half a pita and Saltine crackers were interesting choices for accompaniments. I associate Saltines with being broke or nauseous. The sign on the ladies’ room door. Again with the fruit hat. 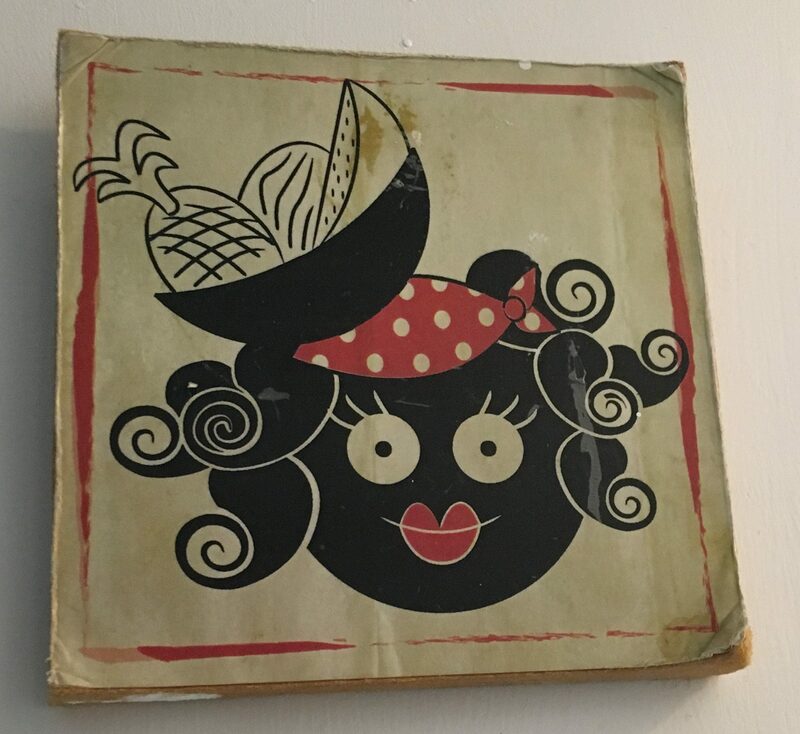 If a restaurant in Minneapolis used this sign, there would be protests that it was racist or at the very least, a case of cultural appropriation. But this restaurant was owned and operated by Black Caribbeans, so there. After lunch we returned to the hotel and I headed straight for the pool. If you’re not a water person, you don’t understand the pure bliss of being in water in the sunshine, surrounded by plants and two very noisy parakeets in a big cage. I don’t really even know how to swim but I can splash around in a pool for hours. I ordered a print of this photo and keep it on my desk at work. I escape here when I need to. Our last evening in Colombia. 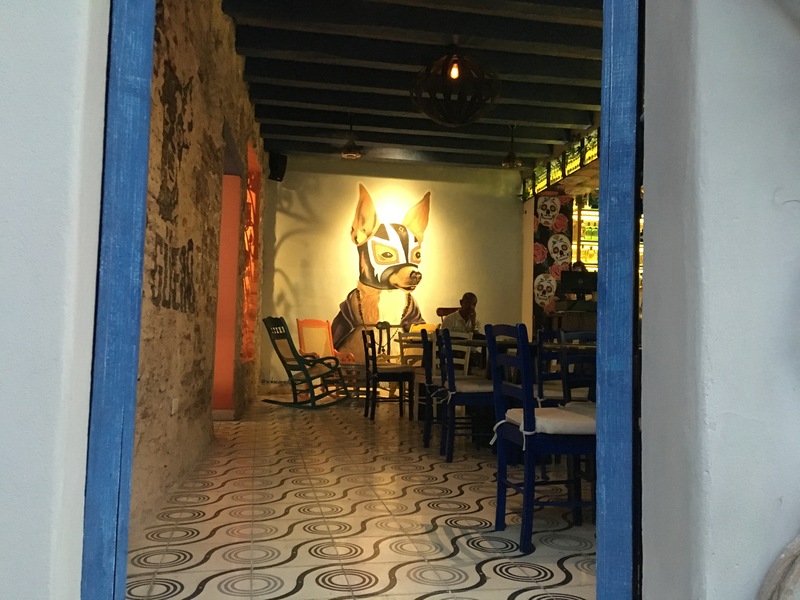 Nora had suggested only one thing—Getsemani—a bohemian neighborhood. “It looks like all we have to do is cross a street,” I said to Lynn as I consulted the map. But we got clever and left a trail of bread crumbs in the form of photos. From one side of the clock tower to the other, dusk fell that fast. With any luck it would be lit up after dark, right? 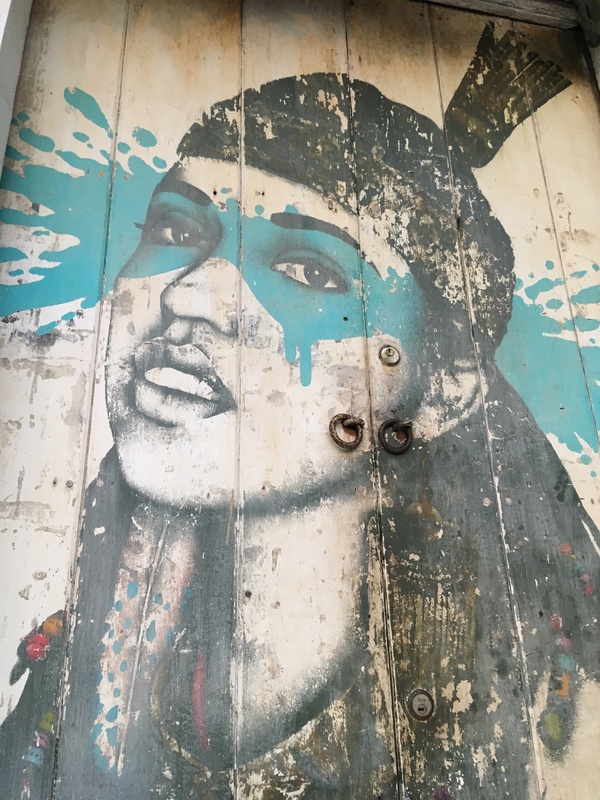 This entry was posted in Adventure, Budget travel, class divide, Culture shock, Travel and tagged Cartagena, Colombia, Getsemani on May 31, 2018 by Breaking Free. Colombia has been in the news lately in the US. Last night there was this story on the PBS News Hour about the election, which is taking place the day this posts. Near the end, it talks about all the activists who have been threatened—and more than 50 who have been killed—in the ongoing conflict for power. 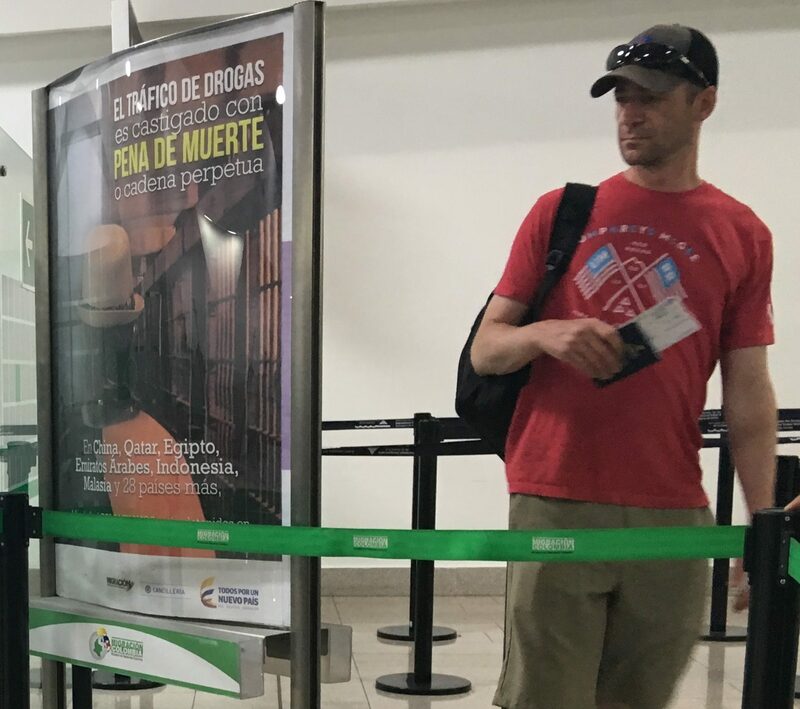 So I wasn’t overreacting when I worried about our tour guide in Bogota being at risk. I wrote that Lynn and I would follow him on Facebook and maybe raise a stink if anything happened to him but in reality, what could we really do? If he suddenly stopped posting, what would we do—call the police in Colombia? I’m sure they would get a good laugh out of that. We could contact Human Rights Watch or Amnesty International. I don’t know. It’s another thing to worry about, along with all the plastic in the ocean and the violence in Gaza and Russian interference in the US elections. That last one is kind of amusing, until you really think about what will happen to the poor mouse. 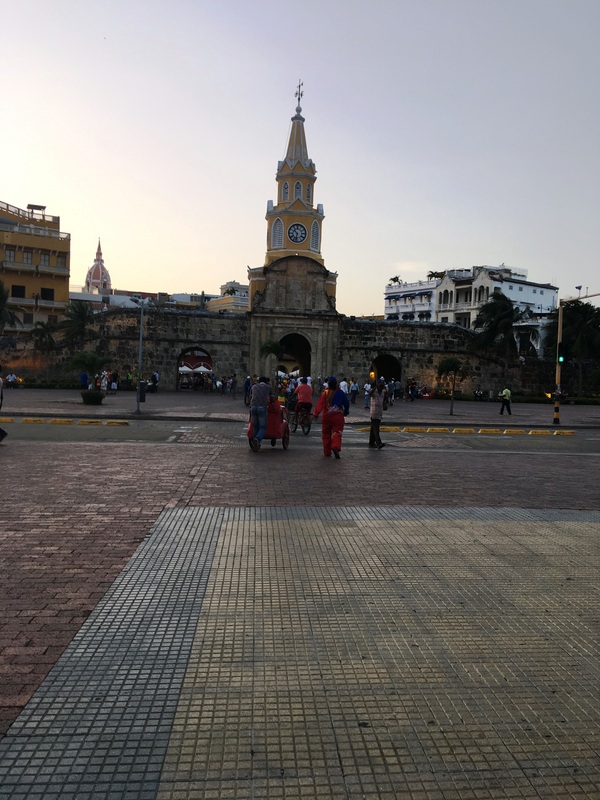 “Exact numbers of people who have arrived are hard to come by and it is difficult to ascertain if people intend to stay in Colombia or move to another country in South America or the Caribbean. 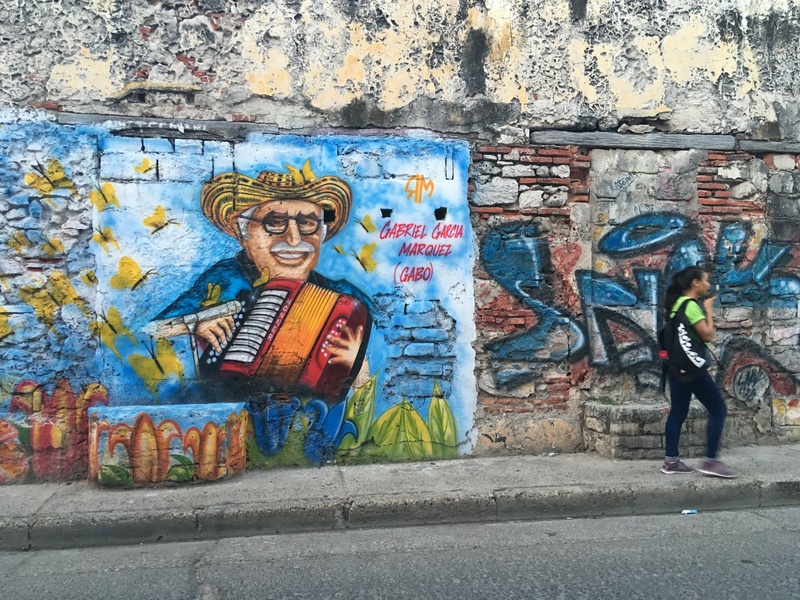 “The lack of accurate data influences the way the United States State Department, U.S. Agency for International Development, and NGOs can plan for and respond to the crisis, a problem the Colombian government hopes the census will help solve. According to [Felipe] Muñoz, there are 30,000 Venezuelan children in the Colombian public school system, and 25,000 in the child care system. Twenty-five thousand Venezuelans have been provided free medical care by Colombia’s public health system. 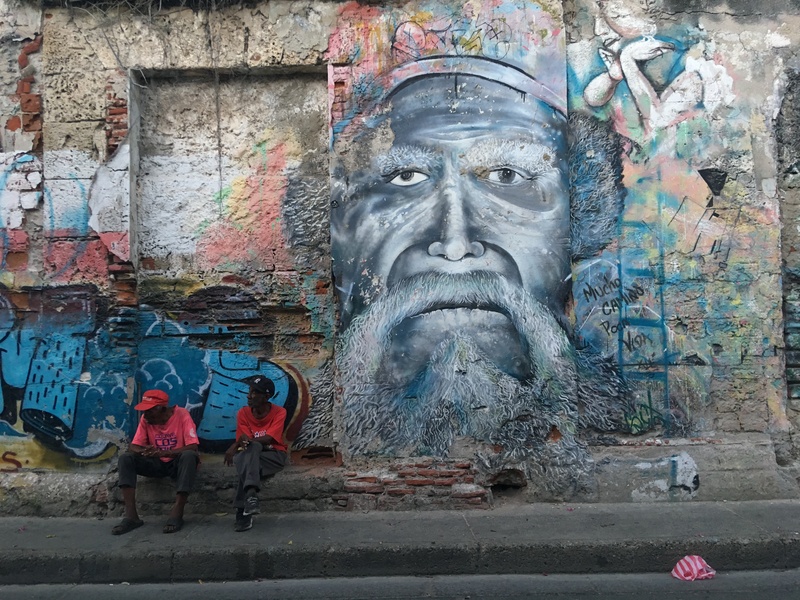 “The Colombian government also intends to set up a formal process for Colombians who had fled their own country during a decades-long civil war for Venezuela, but now seek to return home. This includes children that have a parent from each country but were born in Venezuela and do not have Colombian identity papers. This almost makes me weep. What a contrast between how Colombia, where the average monthly salary is $692, treats refugees vs. my country—where the average monthly salary is $3,428. We are a country living with an epidemic of fear and hatred. Lynn and I slept the sleep of the dead after our five-hour drive and two-hour walking tour. Breakfast was on the rooftop restaurant, which had great views. That’s the Cathedral in the distance. We noted that the hotel had witch points on some of the rooflines. Nora had told us this was a Colonial-era building requirement by the Catholic Church—to keep witches out of buildings. I guess it works, because we never saw a witch, inside or out. Soon we were out on the street. Here’s the Cathedral again, in the distance. Such a beautiful city. The interior was cool and quiet. Lynn led us on to Iglesia San Pedro Claver. St. Peter Claver, as we know him in the US, was a priest from Barcelona, the first saint of the new world, and—so the legend goes—a champion of slaves. 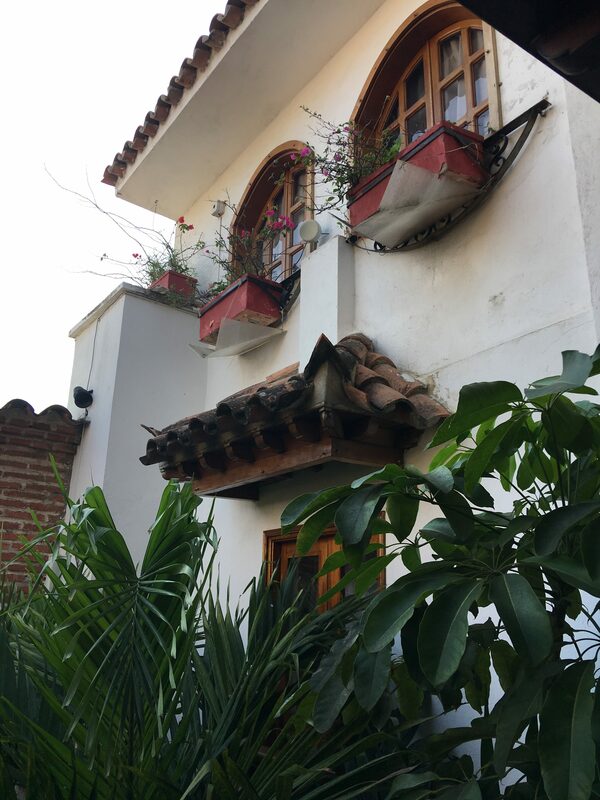 This entry was posted in Adventure, Animal Abuse, Budget travel, class divide, Culture shock, International Development, Travel and tagged Cartagena, Colombia, Refugees, Venezuela on May 27, 2018 by Breaking Free. 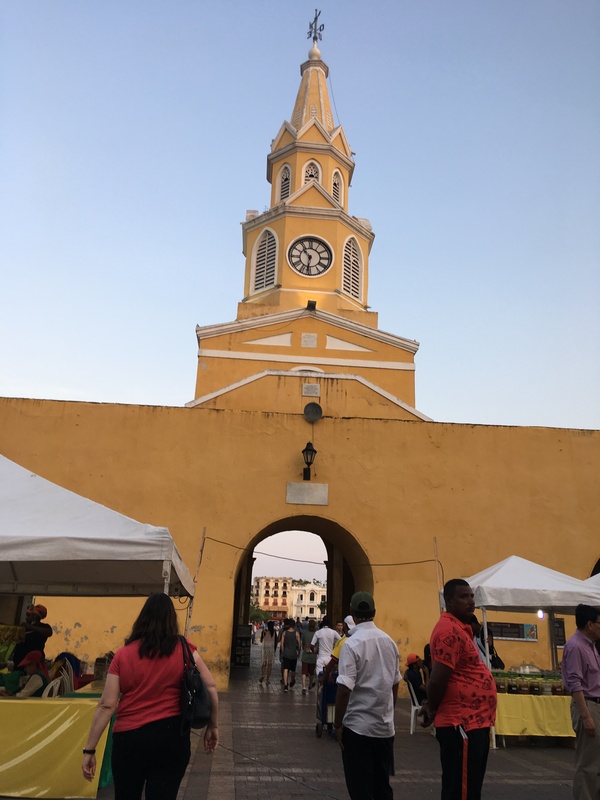 I’m not sure why we were driven five hours from Tayrona to Cartagena, but Lynn and I agreed it was important that we did because it showed us sides of Colombia we wouldn’t otherwise have seen. We drove south along the coast past more beautiful beaches. 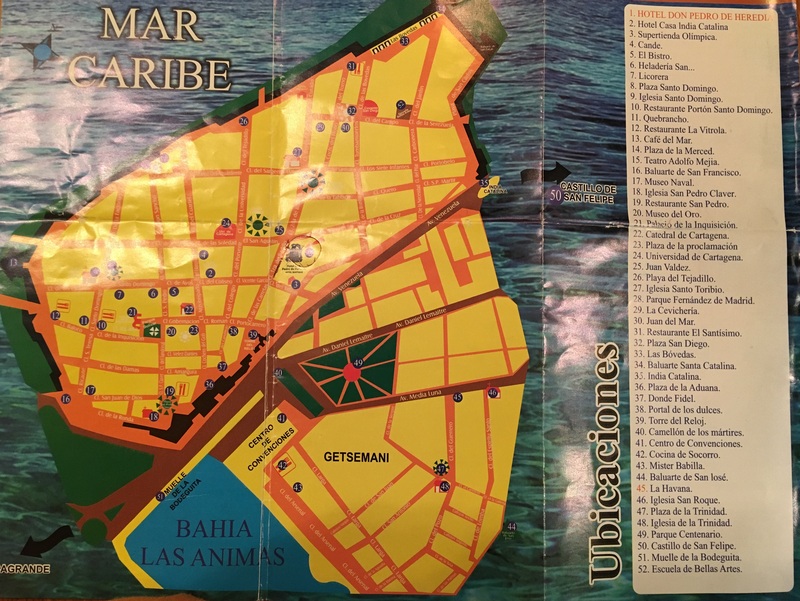 If we had flown from Santa Marta to Cartagena we might have been left with the impression that all of Colombia was unspoiled. 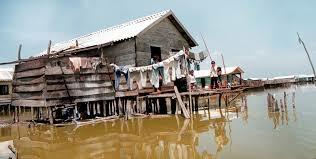 But soon we were driving over a very long causeway with what I can only describe as water-logged slums on either side. I found some photos of the place, Tasajeras, online. This area stretched along a couple of miles. 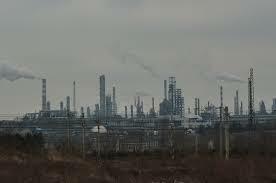 Our driver said something about the residents being dependent on tankers for clean water. Ironic, given that they were surrounded by water, but it made sense. There were no signs that the houses had indoor plumbing. 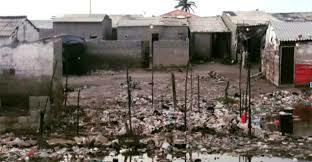 And here we were, sitting in air-conditioned comfort behind tinted glass, our suitcase contents probably more valuable than the entire contents of one of these homes. In dollar terms, anyway. Everywhere I go, I am very conscious of being a one percenter. I’m not a one percenter in the US, but I imagine that, compared with the population of the planet, my net worth is higher than 99% of the rest of my fellow humans. At home, I am probably solidly in the middle, which is fine with me. As I’ve written before, I started my adult life at 17 by getting pregnant, going on welfare, and moving into subsidized housing. I’ve worked hard to get where I am, but I know firsthand that the vast majority of people in the world can never get ahead no matter how hard they work because they have no social safety net to support them until they get traction. And the US is heading backward in that direction. So I have donations to certain causes automatically deducted from my bank account (HIAS is one of my favorites). I volunteer to do some small part in fighting mass incarceration in the US, and I work for a nonprofit that supports people who have been affected by war trauma. Lately I have been trying to buy less plastic. It’s so hard. Everything is packaged in plastic. I got an Amazon order last week where the item came inside a small plastic tub, wrapped in a plastic bag, mailed in a giant bubble-wrap plastic envelope. It made me feel sick. I set the envelope aside and meant to write to Amazon to complain, but I never did. 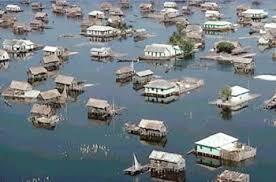 Now, recalling all the plastic and other waste choking this watery community in Colombia, I wish I had made the effort. When I travel I tell myself I am supporting the local economy. Is this true? Would it be better if I stayed home, reduced my carbon footprint, and send a check for the amount of the tour to some Colombian charity? I don’t know. 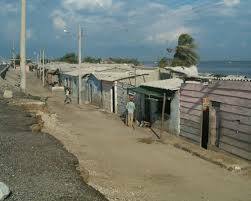 We drove through Barranquilla, a city of over a million. I’m sure there are many very nice areas of Barranquilla, but this was pretty much what we saw for 20 minutes as we passed the outskirts. “Shakira,” said the driver out of the blue, pointing to the city. Apparently the hip-shaking pop singer is from here. We drove through a nice residential area down a wide boulevard with signs that announced “Free Wireless,” and just for kicks I tried to connect but we moved on too quickly. That’s great that they’re making internet available in public parks, I guess. We stopped at a light and two young men started washing the windshield. “Venezuelans,” said our driver, as he rolled down his window and gave them some money. “I don’t need my windshield cleaned but they have no other way to earn money,” he explained. So a few of my tourist dollars did trickle down. Two more hours. The driver’s phone rang and he handed it to me. It was someone from Responsible Travel. “We have changed your hotel to a much nicer hotel,” she informed me. Um, okay? Who knows what happened and it doesn’t matter. I was just ready to get to a hotel, any hotel. 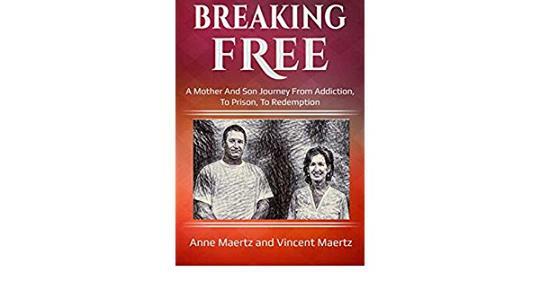 This entry was posted in Adventure, Budget travel, class divide, Culture shock, International Development, mass incarceration, Poverty, Teen mothers, Travel and tagged Barranquilla, Cartagena, Colombia, Tasajeras, Tayrona National Park on May 21, 2018 by Breaking Free.